* Perfect for corridors between cities where highway right-of-way is available and high-speed, high-capacity service is needed. * For crowded metro (commuter) systems where high passenger-carrying capacity is needed and right-of-way is scarce. This monorail system has a wrap-around-the-beam design which makes it extraordinarily stable, safe, comfortable, and fast. It is an advance version of earlier monorail designs with greatly improved performance. This high-speed monorail is powered by a linear motor which is very quiet (has no moving parts), drives the monorail at high speeds, enables it to climb steep grades, and operates in rain, snow or ice. By combining this type of fixed guideway system and linear induction motors, a substantial amount of "lift" can be generated as well as "thrust". This MagliftTM technology has been qualified by the federal government as being eligible for federal funding under traditional "maglev" programs. However, this MagliftTM technology differs substantially from conventional high-risk, high-cost, maglev systems in that it develops substantial lift without losing contact with the guideway, thus providing a safer more cost effective transportation solution. This monorail system is excellent for intercity applications. It can travel at very high speed, can follow an interstate highway's route (staying within the existing right-of-way), and is less expensive than other rapid transit systems. The monorail has advantages over other intercity solutions including conventional trains (i.e. TGV, etc. ), and maglev systems (i.e. German Transrapid and Maglev 2000, etc.). This monorail is equally at home in metro (commuter) applications. Its elevation above existing roads eases land acquisition and usage problems. It offers high passenger-carrying capacity, and can be integrated seamlessly with an intercity system with the same monorails, building ridership throughout the system. The monorail has advantages over other metro solutions, including highway widening, light rail construction, pendulum monorails, commuter rail, and automated people movers. This monorail is friendly to the environment. It is quiet, requires minimal excavations and rock cuts, minimizes the acquisition of new right-of-way, and is energy efficient. There are an estimated 100 corridors worldwide connecting city-pairs which are 150 to 600 miles apart--a market where a high speed monorail could compete effectively with air and highway travel. Twenty-six of these corridors have been identified in the US. Net economic benefits are a significant factor in selecting a high-speed transportation system. MagliftTM monorail technology has low capital cost, low operating costs, high passenger comfort and service, and significant indirect benefits to society such as reduced highway congestion and reduced automobile exhaust emissions. When estimating the cost of a monorail system, the dominant factors are the cost of ROW acquisition and the need for special structures (tunnels, bridges). A key to all transit projects is the ability to organize a consortium of companies which bring together the financing, engineering, construction, and project management expertise necessary to execute a major transit project. Local companies should normally be included in a consortium to bring important local insight and support. We invite you to e-mail Meneren principal, Bill Tolbert, if you would like to discuss a high-speed monorail system for your corridor. This page was updated December 10th, 2004. Please refer to Legal Disclosure for important information. Copyright © 1999, 2000, 2001, 2004 by Meneren Corporation. 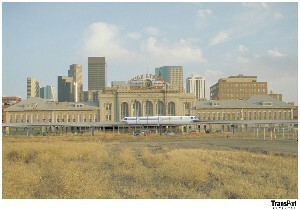 TransPort Ventures LLC, a wholly-owned subsidiary of Meneren Corporation was competitively selected by the State of Colorado to design, construct, and operate a 170 mile high-speed monorail system that will connect DIA (Denver International Airport), stop in the center of the City of Denver, and proceed up the Rocky Mountain corridor to the ski areas (including Vail), and on to the Eagle County Airport. MagLift Technology has been designated a "Maglev" technology by the US Department of Transportation. However, unlike fully levitating Maglev systems, MagLift is substantially lighter, lower cost, and can stay within highway right-of-ways.